Related topic: How to Create a Custom Signature. This tutorial was written using the browser Firefox. So now you have a custom image you are ready to add to your forum signature for everyone to see each time you post. It’s never been easier! Make sure your image is no larger than 225 x 225 pixels. That is the largest size the forum will allow us to add. 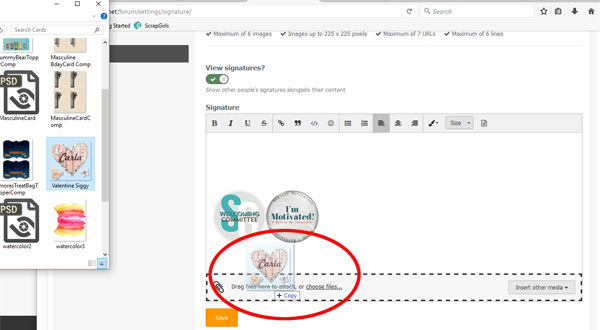 Like many other programs out there, we have several options on how to add an image to our signatures. Let’s get started with the first two. 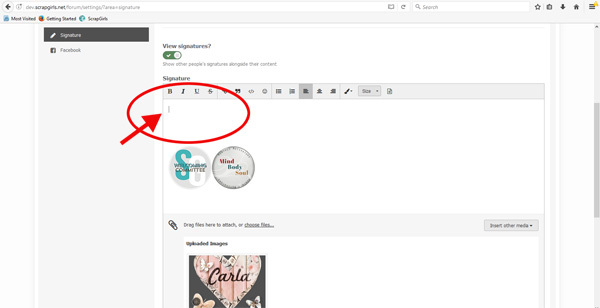 First, click on the drop down arrow next to your username in the upper right hand corner of the forum home screen. Then click on Account Settings. On the left side, click on Signature, with the cute little pencil icon next to it! Now we can start customizing our signatures! Notice the restrictions (1below). We can also choose whether or not to view other people’s custom signatures. (2 above). You may choose to turn this off if you are using a slow internet service. Then finally, a box to create your custom signature. At the bottom of the box (3 above) there is a bar to “drag files here to attach” or “choose files”. Adding your new signature could be as easy as dragging and dropping the file into this bar (Method 1)! 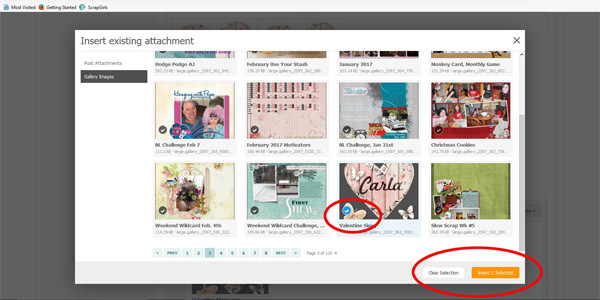 Or, if you choose to click on the “choose files” method (Method 2) just navigate to your image and click open. Here is an example of dragging and dropping an image into the upload bar. Notice that the bar now has the “marching ants” around it as I hover the image above it. When you are ready to place your image in your signature, place the cursor where you want the image to be placed. Click on the image and it will appear in your signature where your cursor is. It’s that easy! Now you have the option to make edits by double clicking on the image if you wish. 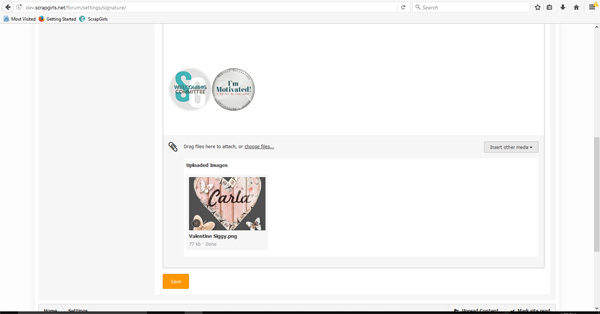 Once you are happy with the changes and you are ready to show off your new signature, click on the orange Save button and Voila! You may have noticed the button on the right end of the Drop and Drag bar, “Insert other Media”. 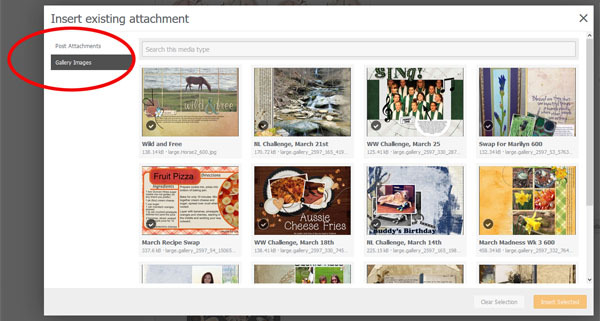 If you choose “Insert Existing Attachment”, a window will open up and you will have a choice of uploading an attachment from a forum post (if you play the Slow Scrap Monthly Games and post your daily progress, this is an example of an attachment from a forum post), or Gallery Images. Simply click on the image you want to add to your signature and then choose the orange button “Insert 1 Selected”. Again, make sure your cursor is blinking in the location you want your image to appear. If you choose “Insert Image from URL”, a window will pop up. Just paste in the URL of the image you wish to add to your signature and click the orange button “Insert Into Post”. When you are happy with the results, click the orange “Save” and you are ready to show off your new signature!